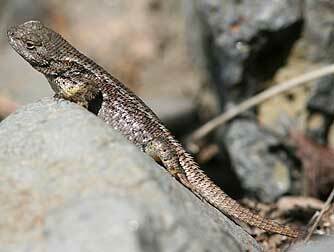 Western fence lizards or Sceloporus occidentalis live in northeast Washington to the south-central region and south through Oregon and California. They favor dry wooded areas, where they they hunt insects and spiders and perch on rocks, trees and fences-- easy prey for other predators such as hawks and snakes. 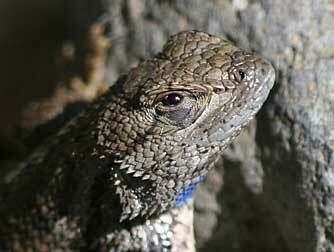 Fence lizards are closely related to sagebrush lizards and males of both have blue patches under the throat and belly. These lizards have been found to kill Lyme disease bacteria that infect ticks, which commonly feed around the ears of these lizards. 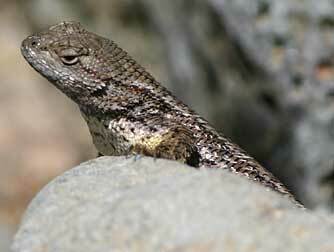 The incidence of Lyme disease is much rarer in regions having Western fence lizard habitat.